Hi :) Okay, I'm looking for a TV mostra about spazio travel, probably situated in the 70's. The characters have weird carvings in their forehead. Thanks in advance! I'm not sure if this helps, but the only shows I can think of that might vaguely give that impression are some of the assorted stella, star Trek series o Stargate SG1. 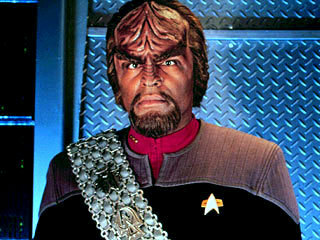 In the stella, star Trek series, it's possible that maybe the Klingons could have looked like that to you. They were darker skinned and had deep ridges in their foreheads. And on Stargate SG1, some of the alien races had emblems on their foreheads. I suspect it might be the Klingons you're thinking of though. You're quite welcome! Out of curiosity, was this what te were thinking of?